To know Arizona well, a person needs to be familiar with the Mogollon Rim (pronounced “MO-ghee-on”) region of the state, stretching from the northwest corner of Yavapai County, halfway between Prescott and Kingman, to the New Mexico border. 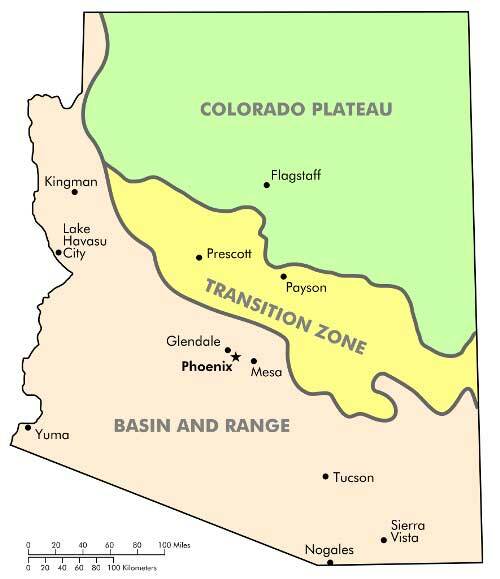 It makes up the bulk of the Arizona transition zone, bridging the Colorado Plateau, in the northeastern part of the state, and the Basin and Range region in the south. 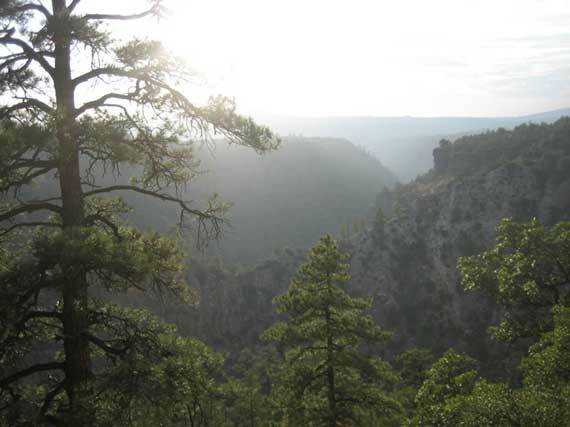 It is also home to some of Arizona’s most pristine and isolated beauty: the numerous canyons that wind their way through the Mogollon Rim are one of the state’s best kept secrets. Depending on where in the roughly 200-mile crosscut of Arizona you make this transition, the journey from desert to mountain can be smooth or abrupt. Take Highway 89 from Sedona to Flagstaff, through Oak Creek Canyon, and you will encounter cliffs, spires, and winding switchback roads that lurch up 2000 feet over a few miles. Driving up the I-17 corridor, however, you will see the transition from cactus to pine over a hundred miles. Those comfortable driving at 60-miles per hour with the window down can experience pine scent in high relief, like the smell of smoke where nothing should be burning, as they wind their way out of the barren lands of southern Arizona. The back road from Phoenix to Flagstaff, via state highway 87 through Payson, combines the two experiences. 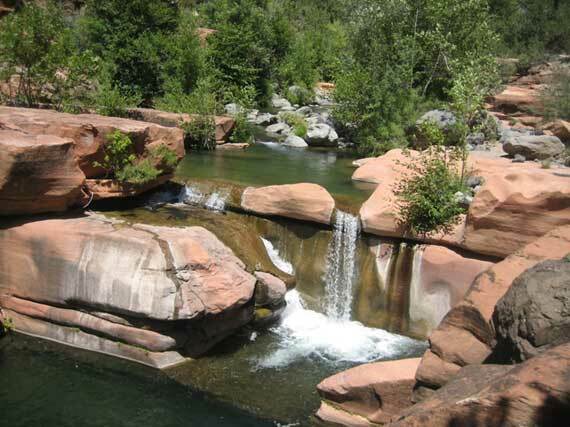 At times smooth, and at others abrupt, this route passes by some of the Mogollon Rim’s most secluded canyons: Tonto Creek, Fossil Creek, Chevelon Canyon and West Clear Creek are just a few of the canyons in the area. 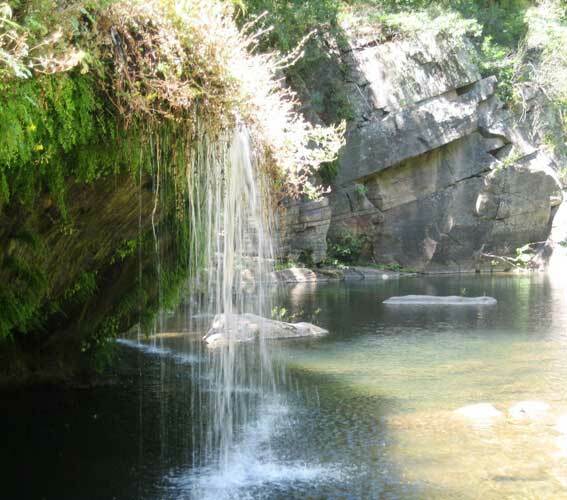 While they are all worth exploring, the crown jewel of the region is West Clear Creek. West Clear Creek (WCC) Wilderness Area starts in the ponderosa pine forests on the north side of the Mogollon Rim, about 40 minutes southeast of Flagstaff. At its headwaters are Willow Creek and Clover Creek, whose waters converge and then flow through WCC’s serpentine maze of basalt and sandstone. Thick with vegetation and lacking much in the way of developed trails or signage, West Clear Creek Wilderness is true back country for most of its 40 or so miles, with limited access, by either vehicle or foot, along the way. Most of the hikers in the canyon enter at Bull Pen State Park in the southern end of the canyon. Everywhere else all but guarantees solitude. And the solitude in these areas is magnificent. 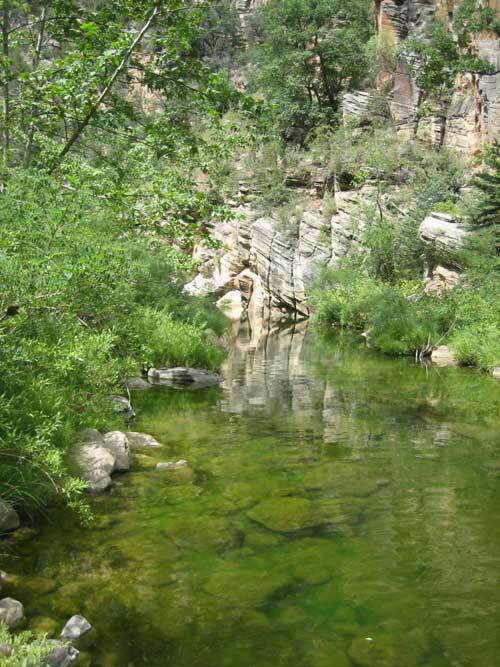 West Clear Creek offers water holes for swimming, excellent fishing, and back country camping. Several portions of the river form narrows—high-walled sections where the river reaches from wall to wall—which are challenging yet gorgeous obstacles for anyone planning to hike. Given this type of terrain, it’s wise to look at West Clear Creek as two types of adventure: quick access for out and back hikes, loop hikes, or shuttle hikes that take one to three days; and through hiking or section hiking the entire canyon, which most hikers should expect to take five days. 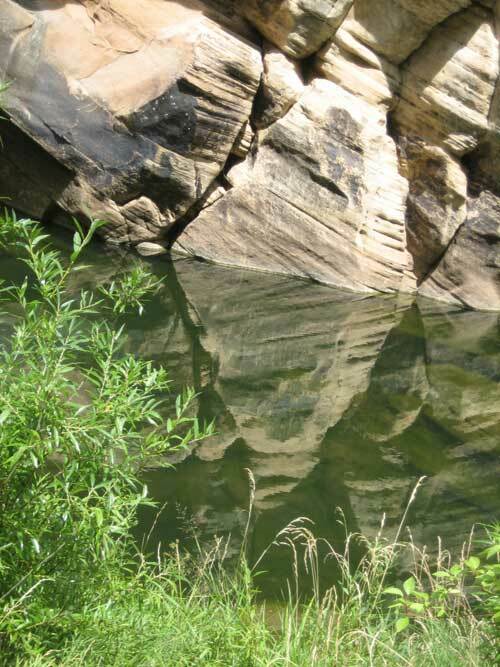 From here you have options to swim, river hike, and fish, although the best swimming holes are deeper into the canyon. Almost all hiking south of here, until about five miles north of Bull Pen, is river hiking, which is to say there are no trails and you will be walking in the water. About two miles downriver from Tramway, on the south side, is an unnamed trail leading down from forest road 142E. From either access point, you’ll walk downstream for about three miles, to the next trail out of the canyon. Before you get there, plan on making at least one short swim, and possibly more, depending on the water level. 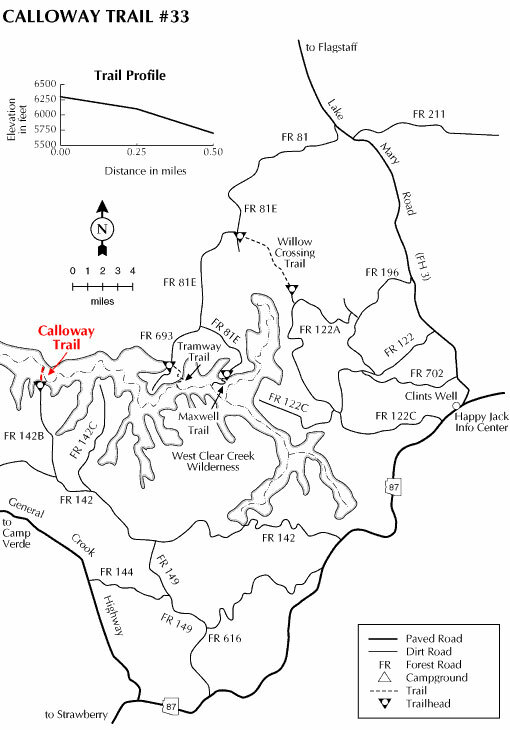 The next access point is the Calloway Trail (forest service trail #33), accessible from the south rim of the canyon, via Forest Road 142B, 6 miles south of the State Highway 87/Lake Mary Road split on Highway 87. (34°33’22.3″N 111°28’35.5″W) Watch for a cairn on the south side of the river just before the river makes a hard bend to the right/north (a note of caution: there’s no signage and rock cairns are impermanent structures, so it’s best to bring a map at least, and possibly a GPS with pre-set waypoints so you don’t miss this trail). Also, before venturing out into primitive wilderness areas with lightly marked, or unmarked trails, you should brush up on your navigation skills and do your own independent research of the area. This is a good place to set up a shuttle, if you’re interested in day hiking. 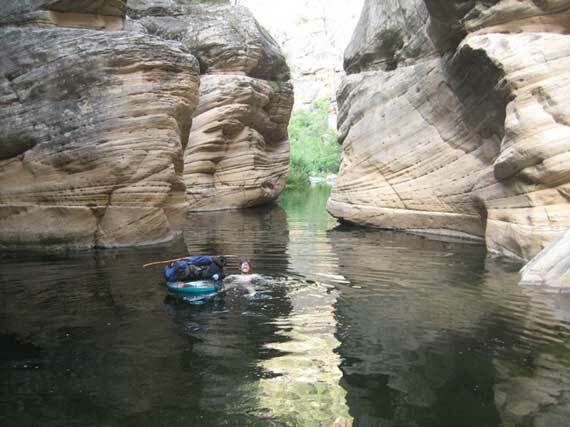 You’ll get to see a nice section of the upper canyon, and a good swim. Just don’t miss the trail or you’ll find yourself walking into a very long canyon. From there it’s another three miles to the access trail leading to forest road 142J and Cash Tank. This is the last exit from the canyon for about two days. Right below here the narrows start and through hikers can expect to swim many, many times before the lower section of the canyon (I counted at least forty swims on my last trip through). This is the heart of West Clear Creek Wilderness Area. The narrows close in to 30 feet in some places and rise 100 feet overhead. Swimming through these sections is chilly work, requiring at least a basic idea of how to swim with a pack and keep your gear dry (discussed at the end of this article). Highlights of this section are the White Box narrows, a 70-yard swim through a corridor of ashen sandstone, and the Hanging Gardens waterfall, a mossy, drippy wonder with space for camping, about two miles south of Cash Tank. You will know that you’re exiting the central portion of West Clear Creek when you come to Big Spring. This will be obvious because of a large, picturesque waterfall smack in the middle of the river. This is one of the best views WCC has to offer, and it’s worth noting that it’s just a bit too far from the lower terminus for a day hike. If non-technical canyoneering and low-impact camping is your thing, you’ll be hard pressed to find a nicer place to pass a warm summer weekend. About two miles downriver from Big Spring is a trail that continues through several campsites and finally leads to Bull Pen Ranch, just 12 miles east of Camp Verde, AZ. If you’ve been through hiking, that trail will come out of nowhere and be a very welcome sight. The Mogollon Rim, Munds Mountain [Apache-Sitgreaves, Coconino, and Tonto National Forests] Map from National Geographic, Trails Illustrated covers the West Clear Creek Area, among others, and makes a good companion for your trip. It also has the added benefit of being waterproof, just in case it ends up in the drink. Some canyoneering is technical, requiring advanced skills in anchor building, rappelling, navigation, etc. This isn’t that sort of trip. It isn’t technical, just long. The only tricks you’ll need here are floating a pack, and packing as lightly as possible. 1) Bring an inner tube, inflate it, and set your pack across. The single advantage to this method is cost, which is in the $10 range—whatever the going rate is for pool toys. The disadvantages are numerous: inner tubes pop or deflate slowly when poked with sharp plants, of which you’ll encounter many in WCC. Bring duct tape! After the fifth swim or so you stop deflating and inflating the tube, which means you’ll be hiking one-handed, carrying an inner tube, further exposing it to sharp plants. Balancing your pack on the inner tube is tricky, especially when the water is moving quickly. Losing your pack isn’t really a concern, but submerging it will add weight; and if you haven’t waterproofed well you could be in trouble. And lastly, the sections of river that are just slightly too shallow to float a pack through are numerous, like stones in the stream. Get ready to pick up and put down your pack and inner tube assembly ad nauseum. 2) For a little more money you can invest in a light pack with holes to drain water, plus a dry bag , which will keep your stuff dry and—bonus—trap air so that your pack floats in the water. Since you’ll be putting your pack right into the drink, make sure you stow everything. Be careful what you put in your side pockets during dry sections. Hiking shoes—an old pair of tennis shoes will work fine. You’re going to beat them up. Forget about Tevas, or even Chacos; your toes will fall off if you try to hike in anything less than shoes. Hiking poles or a walking stick (which you’ll find plenty of along the way) are essential for keeping your balance on slick rocks in the river. Since your shoes will be wet every night, bring warm socks, crocs, or something else light and dry to put on your feet. It gets cold when the sun goes down. Bring layers. And it’s wise to pack for an extra night or two: extra fuel, water purification, and some dehydrated food, as well as a reliable first aid kit. West Clear Creek is well stocked by the forest service with brown trout and various other fish. There are 40 fishable miles throughout the wilderness area. I was able to catch more than one night’s dinner with very mediocre fly-fishing skills. You’ll need a license, of course, which you can pick up in Flagstaff, Sedona, Camp Verde, or most likely one of the smaller towns in the area. Grasshoppers and coachman flies seemed to work well in August. 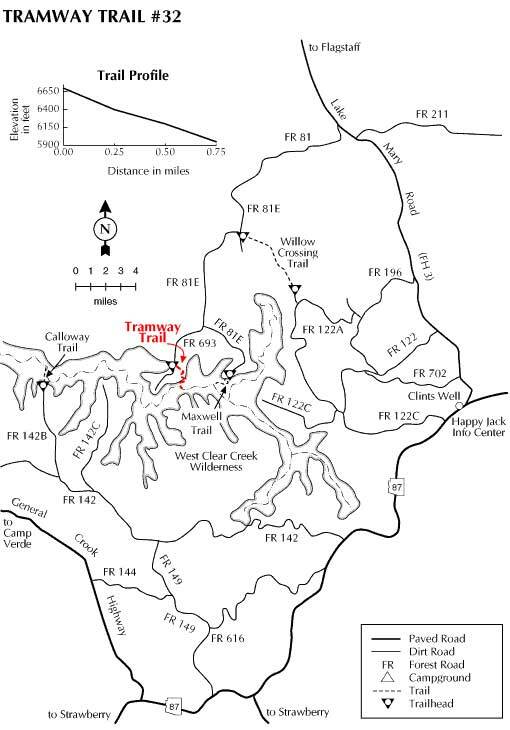 Hikers should plan for limited connectivity anywhere upriver from Bull Pen. Anytime you hike in a canyon please notify someone you know, mark the registry at trailheads, and check the weather in the immediate vicinity, as well as upstream near the headwaters. Impending weather should be considered a sign of a potential flash flood. Guest post by Brian Gruters. Brian writes about science, conservation, and ways that people interact with nature for various publications, as well as his blog, briangruters.com. He is an aspiring surfer, member of the Southern California Mountaineers Association, and likes to explore mountains and canyons. WOW Brian! Loved your article – glad to see you writing! Thanks for the valuable information. Much appreciated as I’m deciding what part of the canyon to hike. Thanks for sharing!! Are the hanging Gardens a part of the hike to Maiden Falls?